Hold mango with a paper towel (to avoid slippage). Using a vegetable peeler, remove skin and discard. With a knife, slice off wide, flat part of fruit on both sides of pit. Trim flesh from pit (discard pit) Place parts cut side down; slice in half horizontally. Cut crosswise into thin strips; cut strips lengthwise into pieces. 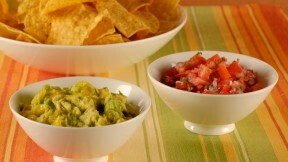 In a medium bowl, combine avocados, mango, garlic, cilantro, lime juice, and serrano chile; season with 1/2 teaspoon salt. Fold gently, leaving texture chunky.